This specie is known only from one mountain in Israel, Mt.Hermon. it was found at the peak of 2000m. These beetles are favorites of mine and I amuse myself all the time with the thought that if an alien would have a dog, it will look like a Curculionid beetle. Interesting creature, greatly capturing this unique beetles. Sharp with great details. Nicely composed picture. What an interesting capture, Oz! Great sharp details, excellent POV and very nice colors. A quite unique animal, indeed. 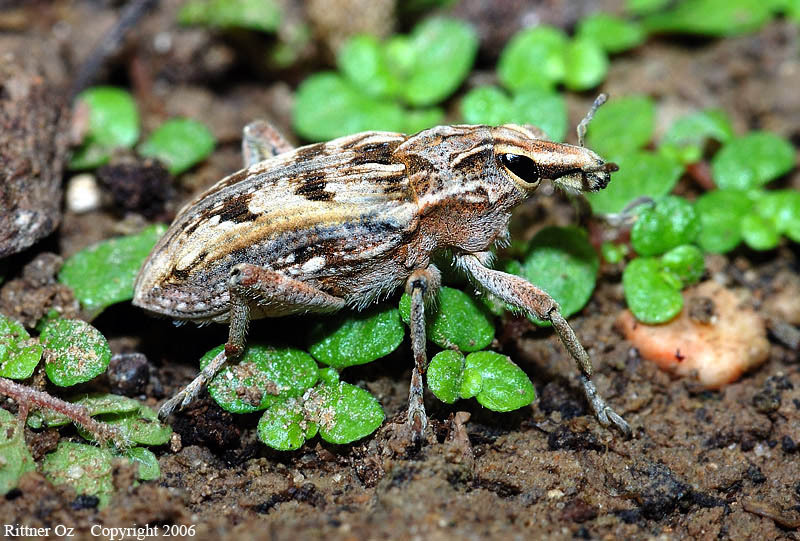 Great picture of this weevil. Very good macro. Nice sharp detail with excellent light, color, and DOF. Good low side POV as well.. I hope that you remain safe..
furry body, pretty eyes, funny nose - that rare endemite you present us here does resemble a dog! Excellent colours and details, and a perfectly chosen low point of view to create an encounter of great directness. Muy intersante foto de esta especie, algo parecida a una que estuve fotografiando hace una hora en mi jard�n ( aqui le decimos bicho moro), espero que hayan salido p�ra publicar en TN. Exclentes detalles en el cuerpo y uso del flash. PD: si necesitas alguna foto del curculionidae, avisame. I do not know why I overlooked this picture before... It is fantastic! Great details and sharpness, and contrast is also amazing! Bravo for this photo also because of insect size - Curculionidae are not a "huge" insects, and even if this one is not the smallest it is not easy to take a good quality image of so convext beetle. Note is not very long but I can find there interesting details about species and that is another plus of this presentation.